Leonard Everett Fisher is a Westport icon. One of our our town’s most cherished artist/illustrators, he’s designed 10 US postage stamps. His works hang in the collections of the Smithsonian, Library of Congress, New York Public Library, Yale Art Gallery and New Britain Museum of Art. At 93 — and a member of the Westport Arts Center’s board of directors — he’s working hard to create a Westport Artists Museum at Baron’s South. But just as important to Fisher was his service in World War II. Between 1942 and ’46 he was a topographical mapmaker. He planned, edited and produced ground maps for invasions and campaigns in Italy, France, Iwo Jima, Okinawa, and the aborted invasion and occupation of Japan. Leonard Everett Fisher at Westport’s Memorial Day last year. More than 70 years after the war, his contributions are finally drawing national attention. This Wednesday (April 11, 10 p.m.), PBS airs “GI Jews: Jewish Americans in World War II.” Fisher is one of the interviews in the film. He’s in good company. Henry Kissinger, Mel Brooks and other Jewish Americans — some famous, others unknown — share their experience as part of the 550,000 men and women who fought for their nation, struggled with anti-Semitism in their ranks, and emerged transformed, to fight for equality and justice at home. The film has already been shown at the Westchester Jewish Film Festival, and the Center for Jewish History. It will be screened this Tuesday (April 10), at the JCC Manhattan. Fisher is one of the oldest living World War II veterans in Westport. Every one has an intriguing story. But only Fisher’s will be told on national television this week. This entry was posted in Arts, History, Organizations, People and tagged "GI Jews: Jewish Americans in WW II", Leonard Everett Fisher, Westport Arts Center. Bookmark the permalink. Leonard is a terrific guy, but Ted Diamond is 100 and a couple others are older than Len. I think you have written about Ted. I’m proud to know Leonard and his wife . He was a great friend of my cousin, Martin Wunsch, also a WW 2 vet. Two guys out of Brooklyn. My family owns some of Leonard’s art, which we treasure. ARLENE. THIS ASSUMES MY MEMORY IS CORRECT . 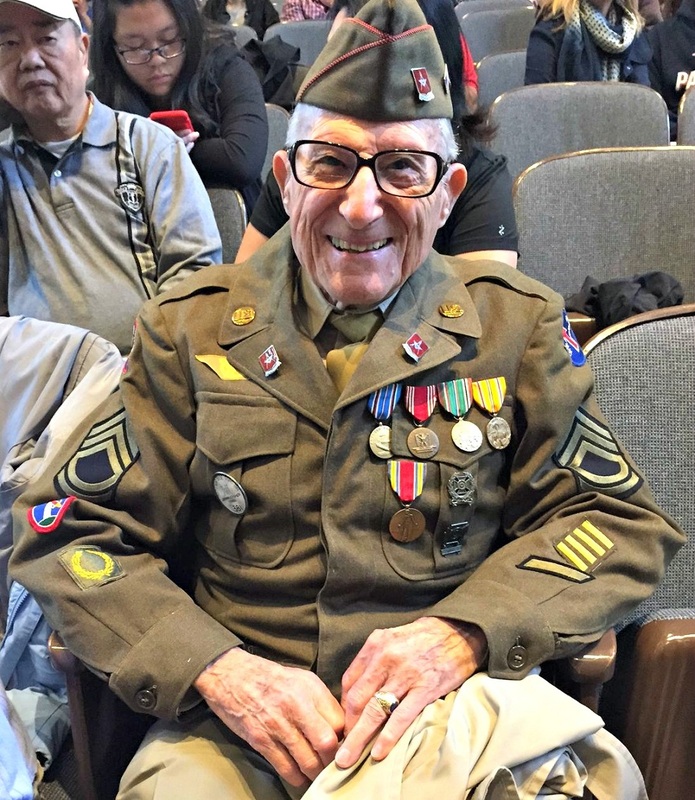 . .
Clay Chalfant—enlisted out of Staples High–3rd Armored Division is 94. Thanks for posting this. Got my DVR set. Leonard is a force of nature. Leonard is not the oldest veteran in Westport, there are several others including Ted Diamond at nearly 101. Dan, Thank you for bringing this to our attention. Is it possible to smile, cry, feel humbled and proud all at once? These men gave above and beyond all expectations and we are the better off because of their contributions. I hope and pray we hear more about them. They were and are men of honor and we need more like them today. They are a dying breed and not because of their advanced age. We have lost something in this country that they exemplify. Oh that we might recapture it. Just clarifying, I posted this after watching the documentary on PBS last night. Should anyone see this, please do take the time to find and watch the show. It was the best hour + I have spent in a long time. Yes, I saw the first part of the doc and it was very well done. The story of the commanding officer—who was not Jewish—at the POW camp who put his life on the line to save all of the Jewish soldiers in his group was especially amazing (and there were a number of incredible stories in this film). Amen & Amen about the Commanding Officer. Where have all the heroes gone? I don’t mean the older ones I mean our younger generations. I have great hopes for the future listening to, watching and reading about the Florida teenagers. Perhaps a new generation of heroes is rising up. It was one of the best documentaries I’ve ever seen on public tv.